The Triangle is an affordable, versatile, central Liss venue offering various size meeting rooms with natural day light and black out facilities - ideal for exhibitions, leisure activities, training and meetings. There is an enclosed courtyard area and a fully equipped kitchen - perfect for parties and dinners. Rooms are available for hire between 9am and 11pm seven days a week. The Triangle is available for exclusive hire as an afternoon or full day booking on Saturdays and Sundays (shared use of the building at other times). An adaptable space that can hold 100 delegates theatre style. 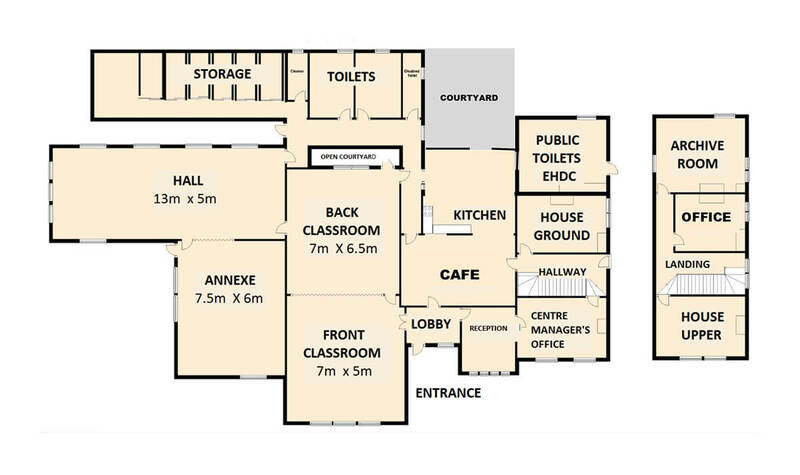 This large open area can be used as an individual meeting space with catering, exhibition or registration in the adjacent Annexe. A dividing sound-proof screen divides the Hall and Annexe which can be opened up to provide an L-shaped space, ideal for Wedding Receptions, Anniversary or Christening parties. Lovely high ceiling, natural light, blackout, lighting, audiovisual facilities and has flexible seating options. These rooms have a dividing screen which can be opened up to give a floor area of 46′ x 42′ (14m x 11m), thus doubling capacity, making it an intimate concert venue, ideal for ensemble groups. Studio style room, ideal for small, quiet workshops holding a maximum of 12 people. Quiet and light room overlooking the village centre. Holding a maximum of 16 people, it is ideal for meetings or classes. We have a selection of rooms available for hire which come equipped with dividing screens, giving you complete flexibility to plan your party. Tell us what furniture you require and how you want it and we can set up the rooms for you. If you are looking for exclusive hire this can be arranged for Saturdays or Sundays subject to availability. When you are Little, Size Matters! As an old school building our rooms are designed for children, so having space to play, run around and make a bit of a mess is not a problem. No more worrying about toddlers and small children falling off big chairs. We have plenty of ‘child-sized’ chairs and tables which are available for setting up your party tea, the use of which is included in the room hire price. Children's party bookings also include use of the kitchen facilities for preparing party food. We also have separate child-sized toilet facilities. The following equipment is available to hire for your event. If there is anything you need that is not listed, please contact us to discuss your requirements.